The guest for this third week of Stephen Downes’ E-Learning 3.0 MOOC was Ben Werdmuller. 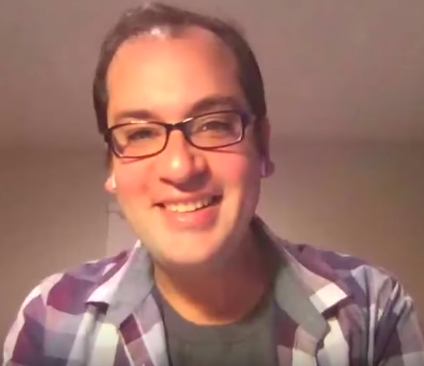 I took a screenshot from the Hangout, because he has such a winning smile. Just what you need for a difficult topic! These weekly conversations with different guest speakers are proving very interesting – a window into another world, for me. Ben Werdmuller, was a co-founder of Elgg. I did have an Elgg account in the early days, but it’s so long ago that I don’t remember exactly when. Probably about 10 or more years ago. I do remember though that I never felt comfortable in Elgg. I could never work out where I was and always felt disoriented, but those were early days in online learning for me. Recently Ben left Matter to join Unlock. Unlock is a protocol which enables creators to monetize their content with a few lines of code in a fully decentralized way. As Ben explained, Unlock enables anyone on the web to make money from your own website without going through a middleman, although it does not have to be about money. It can also be thought of as a decentralised access control system. That open is not always good (I found it refreshing to hear this cautionary but not rejecting perspective). Everyone should have their own website. The warning that open is not always good was discussed in association with a conversation about Blockchain. Stephen has been ‘beefing up’ on this for a while and has shared the resources he has collected for those who want to know more about blockchain (see the end of this post). My focus this week has been on Graph, and I continue to think about the human issues related to these technology developments (see my previous post) , so I have not yet had time to follow up about Blockchain. Ben warned that Blockchain can be misused because it is open, and that there are a lot of privacy and security implications associated with Blockchain. Blockchain could become a safe haven for those communities wishing to cause harm, although whilst users of Blockchain might think they are anonymous, the metadata can be used to figure out who someone is – but it’s harder in Blockchain. One of the unintended consequences of making everything open is that individuals with less power have less control over their data. Those with a lot of money can make their data opaque, but for others their data is transparent. For Ben, not all information should be open. A lot of information is sensitive. However, Blockchain has made people see the value of decentralization. There was then a discussion about the IndieWeb – what is it? The idea behind the IndieWeb is that we should be able to share, discuss and publish from our own websites, ideally with our own domain names. Our sites would then not be controlled by a single company. The problem with these wealthy companies is that their policies affect discourse, for better and worse. They are getting better at dealing with hate speech, but some of their rules do not reduce online abuse, e.g. Facebook insists on the use of real names, which is a problem for, for example, transgender people. The IndieWeb allows you to organise your online activity in a space that you control. Stephen and Ben then talked about the importance of having your own website which you can control, but it is not easy to run your own website. Ben spoke of the bottleneck being hosting, not web technology, and spoke highly of Reclaim Hosting. Reclaim Hosting provides institutions and educators with an easy way to offer their students domains and web hosting that they own and control. I have used both Dreamweaver and GoDaddy to create websites in the past and found them hard work. I have considered whether to move this WordPress site to Reclaim Hosting, but there is very little cost difference (I only pay for two plugins which I renew each year on WordPress) and I am very happy with WordPress. I find it easy to use. I do use a template which I am not 100% happy with, but I don’t feel strongly enough about it to take full responsibility for my own website. At the moment WordPress does everything I need it to do. However, given what has recently happened with Flickr (see – here and here) I can see that it’s important to have a good backup plan. I have recently downloaded all my Flickr photos. They are CC licensed, but it’s better to be safe than sorry. I suppose the same situation could arise with WordPress and Reclaim Hosting. As Stephen mentioned earlier in the course, never forget to Back Up! The suggested solution to these sorts of problems, by Ben, was home-servers, which can host their own websites, but this of course would mean, as with some web hosting sites, that the user needs to know HTML. Even if you don’t care about ownership and control, there are still, according to Ben, lots of reasons to have your own website. By posting on your own website rather than Twitter or Facebook or the like, you are adding value to your own voice and not fitting into a template. You can decide how to organize the different types of data on your own website. Ben discussed how he has managed his own website and on this course Stephen has published a number of posts about how he has set up and organised gRSShopper. Currently HTML is the barrier to becoming independent and breaking out of templates. I can relate to this, as I don’t want to spend a lot of time ‘under the hood’. So, according to Ben, there is room for more communities to develop a usable independent web, and human-centred design, based on a deep understanding of people, which meets users where they are and is desirable, feasible and viable. This was music to my ears and a good end to the conversation. Today we’ll take a brief look at blockchain. Although presented as a type of currency, blockchain is in essence a graph technology. It creates a record of transactions by chaining them together such that you cannot change or revise one transaction without revising or changing all transactions. Because this is expensive and in some cases impossible, blockchain becomes a permanent record of transactions. I also built my own toy blockchain engine last spring. Here it is: https://halfanhour.blogspot.com/2018/03/building-blockchain.html It steps the reader through fundamental concepts of a blockchain and the major elements of a blockchain engine. Although this is the only day in the course dedicated specifically to blockchain, really what we should see is that blockchain is just one step in the narrative we’ve already been developing while talking about linked data and cloud technology, and a narrative that will continue through the remaining weeks of the course. As with the other topics in the course, it is possible to dive very deeply into the subject. From the perspective of E-Learning, though, the idea is to get an overview of what is happening and seek to apply it to a projection of likely trends in the next decade or so. This is a good crisp summary that doesn’t shy away from technical detail but steps through the major elements of blockchain technology with clarity and precision. The sections on blockchain components (section 3) and consensus models (section 4) are particularly strong. It even comes with a fun blockchain use case flowchart. This podcast transcript provides a level-headed overview of blockchain technologies focusing especially on the trade-offs the use of blockchain entails (for example: less efficient databases in exchange for immutability). There’s also a nice table depicting the major use cases for blockchain. And there’s a nice look at the different motivations for employing blockchain. This is a long (136 page PDF) and detailed report on blockchains in education. The authors work slowly and deliberately in their pursuit of accuracy and clarity, which results in a presentation that will be easily understood by most readers. There is a wealth of examples in the document describing use cases, scenarios and pilot projects, and companies involved in the space. This is why I keep paying attention to the work that Greg and others are doing. I’ll get there. Interesting reflection Jenny on owning your own domain. I am an advocate for this, being both immersed in the IndieWeb and using Reclaim Hosting, however I am mindful that one size never fits all. I always come back to this post from Mike Caulfield. Thanks Kevin and Aaron for your comments. Like you Kevin, I am just trying to pay attention and get a glimpse of what may be to come. And thanks Aaron for the link to Mike Caulfield’s post, which I hadn’t seen. I am not an early adopter, in the sense that I do not jump in straight away. I wait and see how it’s all going to pan out. So for example, I was aware of and saw demos of Second Life, when it was very new, but never got involved, and I’m quite pleased now that I didn’t spend hours of my time trying to figure it out. But I do like to keep as informed as possible about what might be coming up. That’s why this course is proving so useful.